Amalek (Hebrew: עֲמָלֵק, Modern Amalek Tiberian Ămālēq) is a figure in the Hebrew Bible. Amalek is the grandson of Esav, who is the brother of Yaakov and became his archenemy due to an ancient offense. This offense and anger is rooted in the fact that from the start when the twins Jacob and Esau were in Rebecca’s womb, ADONAI said that the older would serve the younger! Beresheet 33:3 Then he crossed over before them and bowed himself to the ground seven times, until he came near to his brother. Beresheet 33:4 But Esav ran to meet him, and embraced him, and fell on his neck and kissed him, and they wept. Amalek (Hebrew: עֲמָלֵק, Modern Amalek Tiberian ʻĂmālēq) "a people that licks up" is a figure in the Hebrew Scripture. 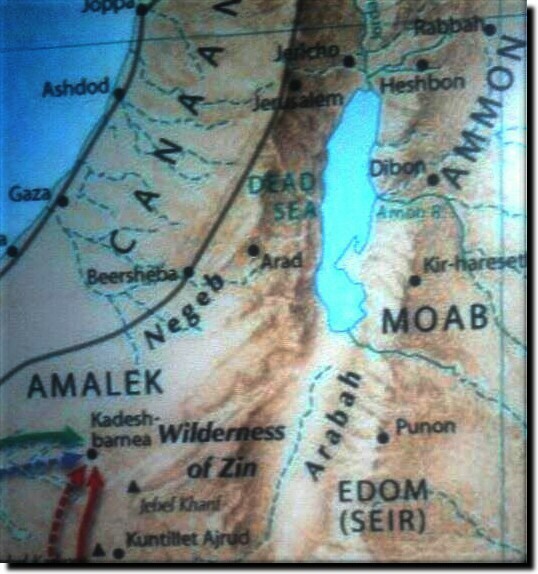 The Amalekites were not Arabs, but of a stock related to the Edomites (consequently also to the Hebrews). In the Tanakh, the Amalekites are nomads who attacked the Hebrews at Rephidim (Shemot 17:8-10) in the desert of Sinai during their exodus from Egypt: "smiting the hindmost, all that were feeble behind," (Deuteronomy 25:18 HE). The Tanakh recognizes the Amalekites as indigenous tribesmen, "the first of the nations" (Numbers 24:20). The name is often interpreted as "dweller in the valley", and occasionally as "war-like," "people of prey", "cave-men" In some rabbinical interpretations, Amalek is etymologised as a people am, who lick blood, but most specialists regard the origin to be unknown. According to the Book of Beresheet and 1 Chronicles, Amalek was the son of Eliphaz and of the concubine Timna. Timna was a Horite and sister of Lotan. Amalek was the grandson of Esav (Beresheet 36:12; 1 Chr. 1:36) who was the chief of an Edomite tribe (Beresheet 36:16). In Jewish tradition, the Amalekites came to represent the archetypal enemy of the Jews. The first Agag is mentioned very briefly by Balaam in Numbers 24.7, the context implies that he was a king, but he is not clearly stated to be an Amalekite. The second and better-known Agag was taken alive by King Shaul after destroying the Amalekites (I Shemuel 15). His life was spared by Saul and the Israelites took the best of the sheep, cattle, fat calves and lambs from the Amalekites. One may consider the hypothesis that each of their kings bore the hereditary name of Agag (Num. 24:7; 1 Sam. 15:8). Agag's death might be expected to have been the end of the Amalekites; however, they reappear in later periods described in the Scripture . Even Shemuel says to Agag: "As thy sword hath made women childless, so shall thy mother be childless among women." Agag, an anscestor of Haman's, was the Amalekite king killed by Shemuel HaNavi (as related in I Shemuel 15). 5 When Haman saw that Mordechai would not kneel or bow before him, Haman was filled with wrath. The Midrash relates that when Mordechai would not kneel, Haman said to Mordechai: "Are you better than your ancestors, who bowed to my ancestor Esau?" (as per Genesis 33:3) To which Mordechai replied, "My ancestor, Benjamin, was not yet born at the time, and did not bow." Mordechai was a reincarnation of Jacob, and Haman of Esau. Mordechai's refusal to bow rectified Jacob's bowing to Esau. Although the descendants of Esav were, on the whole, known as Edomites, one group of Esav’s descendants developed separately and were known as the Amalekites (Bereshit 36:1,9,12; Shemot 17:8; Softim 3:13; Shemuel Alef 15:2,15). They were a race of wild desert nomads who were scattered in an area extending from the far negev Kenaan across the Sinai peninsular. When the Yisraelites were escaping from Mitzrayim, the Amalekites raided the weak and defenceless who were lagging behind in the procession. Because of this, HaShem commanded that when the Am Yisrael were established in Kenaan they were to wipe out the Amalekites (Shemot 17:8-16; Devarim 25:17-19). In the meantime the Amalekites continued to attack the Yisraelites, both before they entered Kenaan and after they had settled there (Bamidbar 14:45; Softim 3:13; 6:3,33; 10:12). Melekh Shaul was commanded to destroy them completely, but although he won a notable victory, he failed to carry out the task fully (Shemuel Alef 15:1-33). Those who survived continued their bandit-like raids, but with less frequency and less effect. Gradually the Amalekites were absorbed into other groups in the region and eventually the race died out (Shemuel Alef 30:1-20; 1 Chronicals 4:41-43). (Timna was a concubine of Eliphaz, Esav's son; she bore Amalek (עמלק) to Eliphaz.) These are benai Adah, Esav's wife. Korah, Gatam, and Amalek; these are the chiefs of Eliphaz in the land of Edom; these are benai Adah. Then Amalek (עמלק) came and fought with Yisrael at Rephidim. So Yehoshua did as Mosheh told him, and fought with Amalek (עמלק), while Mosheh, Aharon, and Hur went up to the top of the hill. Whenever Mosheh held up his hand, Yisrael prevailed, and whenever he lowered his hand, Amalek (עמלק) prevailed. And Yehoshua overwhelmed Amalek (עמלק) and his people with the sword. Therefore when ADONAI your Elohim has given you rest from all your enemies around you, in the land that ADONAI your Elohim is giving you for an inheritance to possess, you shall blot out the memory of Amalek (עמלק) from under heaven; you shall not forget. Thus says ADONAI of hosts, ‘I have noted what Amalek (עמלק) did to Yisrael in opposing them on the way when they came up out of Egypt. And Shaul came to the city of Amalek (עמלק) and lay in wait in the valley. And Shaul said to Shemuel, “I have obeyed the voice of ADONAI. I have gone on the mission on which ADONAI sent me. I have brought Agag the king of Amalek (עמלק), and I have devoted the Amalekites to destruction. Because you did not obey the voice of ADONAI and did not carry out his fierce wrath against Amalek (עמלק), therefore ADONAI has done this thing to you this day. from Edom, Moab, the Ammonites, the Phlistim, Amalek (עמלק), and from the spoil of Hadadezer the son of Rehob, king of Zobah. 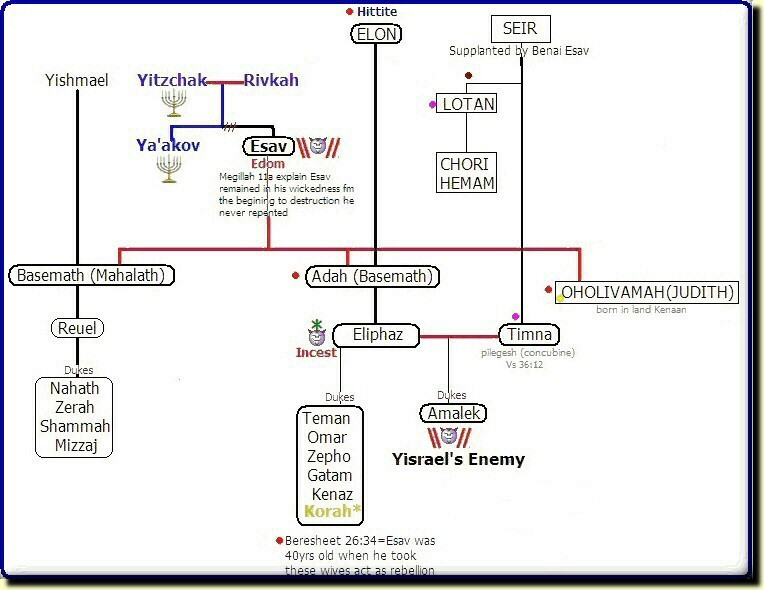 benaiEliphaz: Teman, Omar, Zepho, Gatam, Kenaz, and of Timna,1 Amalek (עמלק). These also King David dedicated to ADONAI, together with the silver and gold that he had carried off from all the nations, from Edom, Moab, the Ammonites, the Phlistim, and Amalek (עמלק). 1. The origins of the Amalekites are unknown. They seem to appear suddenly in Beresheet 14:7, although there is also a mention of an Amalek (עמלק) being born to the family of Esav (Beresheet 36:12, 16). As a result, there are several theories concerning the origins of the Amalekites, none of which can be seen as definitive. 10. The last Amalekite that we here about is Haman, who is said to be descended from Agag (an unspecified Amalekite king). Haman, in the book of Esther, launches a plan to destroy all the Yehudim in Persia (a scheme thwarted by Esther and her uncle, Mordecai). Esther 3:1, 10 8:3, 5 9:24. Esav's son Eliphaz also had a concubine named Timna, who bore him Amalek. These were grandsons of Esav's wife Adah. The Amalekites came and attacked the Yisraelites at Refidim. Mosheh said to Yehoshua, "Choose some of our men and go out to fight the Amalekites. Tomorrow I will stand on top of the hill with the staff of Elohim in my hands." So Yehoshua fought the Amalekites as Mosheh had ordered, and Mosheh, Aharon and Hur went to the top of the hill. As long as Mosheh held up his hands, the Yisraelites were winning, but whenever he lowered his hands, the Amalekites were winning. So Yehoshua overcame the Amalekite army with the sword. Then ADONAI said to Mosheh, "Write this on a scroll as something to be remembered and make sure that Yehoshua hears it, because I will completely blot out the name of Amalek from under heaven." He said, "Because hands were lifted up against the throne of ADONAI, ADONAI will be at war against the Amalekites from generation to generation." Then Balaam saw Amalek and spoke his message: "Amalek was first among the nations, but their end will be utter destruction." Ships will come from the shores of Cyprus; they will subdue Ashur and Eber, but they too will come to ruin." Remember what the Amalekites did to you along the way when you came out of Mitzrayim. When ADONAI your Elohim gives you rest from all the enemies around you in the land he is giving you to possess as an inheritance, you shall blot out the name of Amalek from under heaven. Do not forget! Getting the Ammonites and Amalekites to join him, Eglon came and attacked Yisrael, and they took possession of the City of Palms. Some came from Efrayim, whose roots were in Amalek; Benjamin was with the people who followed you. From Makir captains came down, from Zebulun those who bear a commander's staff. This is what ADONAI Almighty says: 'I will punish the Amalekites for what they did to Yisrael when they waylaid them as they came up from Mitzrayim. Now go, attack the Amalekites and totally destroy all that belongs to them. Do not spare them; put to death men and women, children and infants, cattle and sheep, camels and donkeys.'" Shaul went to the city of Amalek and set an ambush in the ravine. "But I did obey ADONAI," Shaul said. "I went on the mission ADONAI assigned me. I completely destroyed the Amalekites and brought back Agag their king. Because you did not obey ADONAI or carry out his fierce wrath against the Amalekites, ADONAI has done this to you today. Edom and Moav, the Ammonites and the Plishtim, and Amalek. He also dedicated the plunder taken from Hadadezer son of Rehob, king of Zovah. King David dedicated these articles to ADONAI, as he had done with the silver and gold he had taken from all these nations: Edom and Moav, the Ammonites and the Plishtim, and Amalek. Byblos, Ammon and Amalek, Philistia, with the people of Tyre. Beresheet 14:7 Then they turned back and came to En Mishpat (that is, Kadesh), and attacked all the country of the Amalekites, and also the Amorites who dwelt in Hazezon Tamar. Badmidar 13:29 The Amalekites dwell in the land of the South; the Hittites, the Jebusites, and the Amorites dwell in the mountains; and the Kenaanites dwell by the sea and along the banks of the Jordan." Badmidar 14:25 Now the Amalekites and the Kenaanites dwell in the valley; tomorrow turn and move out into the wilderness by the Way of the Red Sea." Badmidar 14:43 For the Amalekites and the Kenaanites are there before you, and you shall fall by the sword; because you have turned away from ADONAI, ADONAI will not be with you." Badmidar 14:45 Then the Amalekites and the Kenaanites who dwelt in that mountain came down and attacked them, and drove them back as far as Hormah. Softim 6:3 So it was, whenever Yisrael had sown, Midianites would come up; also Amalekites and the people of the East would come up against them. Softim 6:33 Then all the Midianites and Amalekites, the people of the East, gathered together; and they crossed over and encamped in the Valley of Jezreel. Softim 7:12 Now the Midianites and Amalekites, all the people of the East, were lying in the valley as numerous as locusts; and their camels were without number, as the sand by the seashore in multitude. Softim 10:12 Also the Sidonians and Amalekites and Maonites oppressed you; and you cried out to Me, and I delivered you from their hand. Softim 12:15 Then Abdon Ben Hillel the Pirathonite died and was buried in Pirathon in the land of Ephraim, in the mountains of the Amalekites. 1Shemuel 14:48 And he gathered an army and attacked the Amalekites, and delivered Yisrael from the hands of those who plundered them. 1Shemuel 15:6 Then Shaul said to the Kenites, "Go, depart, get down from among the Amalekites, lest I destroy you with them. For you showed kindness to all the children of Yisrael when they came up out of Mitzrayim." So the Kenites departed from among the Amalekites. 1Shemuel 15:7 And Shaul attacked the Amalekites, from Havilah all the way to Shur, which is east of Mitzrayim. 1Shemuel 15:8 He also took Agag king of the Amalekites alive, and utterly destroyed all the people with the edge of the sword. 1Shemuel 15:15 And Shaul said, "They have brought them from the Amalekites; for the people spared the best of the sheep and the oxen, to sacrifice to ADONAI your Elohim; and the rest we have utterly destroyed." 1Shemuel 15:20 And Shaul said to Shemuel, "But I have obeyed the voice of ADONAI, and gone on the mission on which ADONAI sent me, and brought back Agag king of Amalek; I have utterly destroyed the Amalekites. 1Shemuel 15:32 Then Shemuel said, "Bring Agag king of the Amalekites here to me." So Agag came to him cautiously. And Agag said, "Surely the bitterness of death is past." 1Shemuel 27:8 And David and his men went up and raided the Geshurites, the Girzites, and the Amalekites. For those nations were the inhabitants of the land from of old, as you go to Shur, even as far as the land of Mitzrayim. 1Shemuel 30:18 So David recovered all that the Amalekites had carried away, and David rescued his two wives. 1Chronicles 4:43 And they defeated the rest of the Amalekites who had escaped. They have dwelt there to this day. There is a remarkable statement that a remnant of the Amalekites had escaped and dwelt in Edom, and that 500 Shimeonites attacked and smote them. 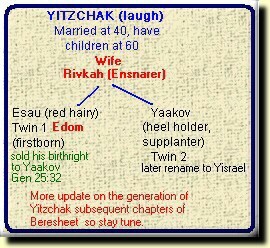 Perhaps this accounts for the priestly genealogies which make Amalek a descendant of Esau and a subordinate Edomite. tribe (cf. Bereshit 36:12; Bereshit 36:16 and 1 Chronicles 1:36). Perhaps here we learn how the powerful Amalek of the earlier time faded away. Tehillim 83:7—a late composition—refers to the Amalekites as still aiding Yisrael’s enemies; but this is probably a poetical imitation of ancient conditions.